I know how silly this looks. 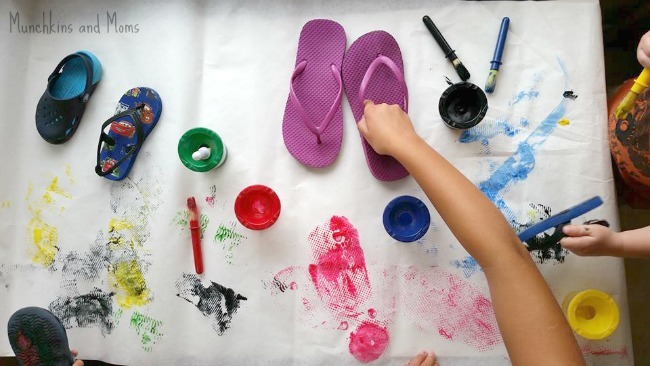 I mean, we have paintbrushes, paint, and paper, so why in the world would we paint with sandals?!? Because it is So. Much. Fun. Really! The soles of shoes have such great texture and variety that they make great stamps for printmaking art! 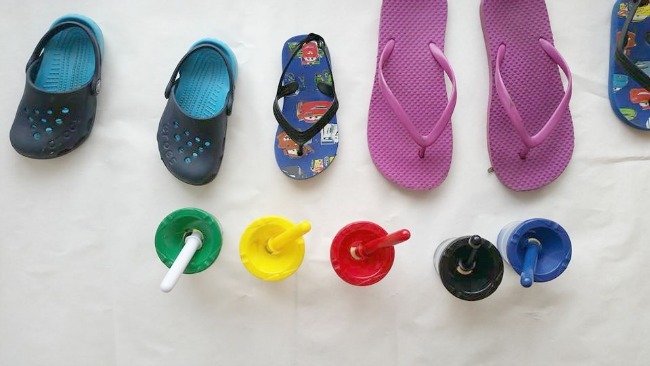 We chose to keep it simple with one pair of sandals for each kid (my 10 year old niece did this with us and loved it!) This kind of activity takes me back to when I worked as a Summer day camp Coordinator. Before I was a teacher (which was before I was a stay at home mom, so many moons ago), one of my jobs was organizing and creating activities for kids from kindergarten through sixth grade. Yup, all those grades together in one day camp. Sometimes it was tough to come up with activities to satisfy such a large age span, but one of the favorite activities was painting. It made everyone happy 🙂 This is the kind of thing that would have made the kids’ faces light up, “Welcome to summer camp! 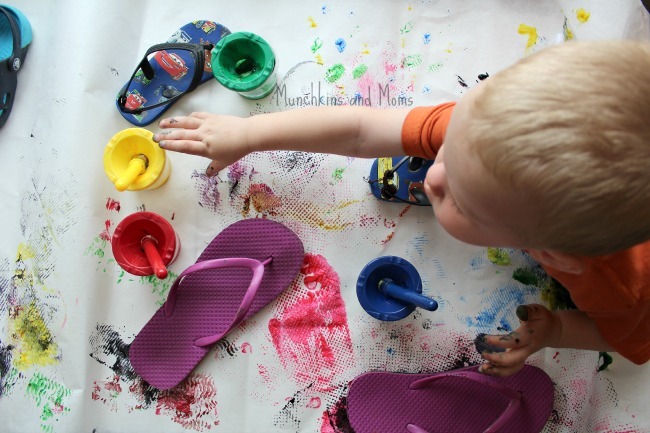 Now everyone take off your shoes and dip them in paint!” Wish I would have thought of this activity back then! While this may not have been a summer camp, my kids and niece totally loved it! The soles of their sandals have such interesting pattern and texture! That makes them super fun to paint and stamp on the butcher paper! It has been a while since we’ve done a cooperative art project (the last one was Fly Swatter Painting). It’s something I want to try to plan more often because it’s truly awesome to see their little hands navigating around each other, negotiating paint colors, sharing paint post, swapping sandals, etc.! There was not a single argument during the whole process. Since they were all working towards a common goal, they were just so cooperative! It’s a rare sight to see them so agreeable! And the other great aspect of this project was it was process art, which means the process of making the art (and collaborating), was more important than the outcome. That gave them the freedom to enjoy the activity without criticism, stress, or preconceived notions about how it was “supposed” to look. They mixed colors, examined textures, and overlapped prints. I think the end result was interesting and beautiful! We will definitely be making this a regular summer activity! 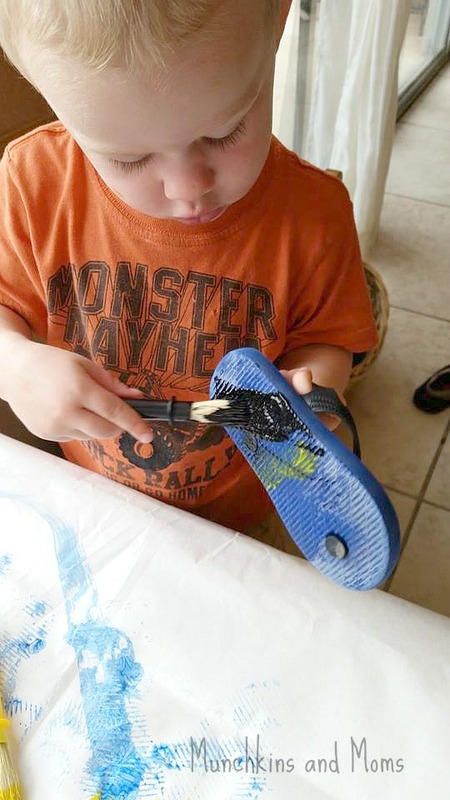 How would your kids enjoy this project? Try it with them and share the result over on Munchkins and Moms Facebook page, or tag Munchkins and Moms (#MunchkinsandMoms) on Instagram! I can’t wait to see how your projects come out!